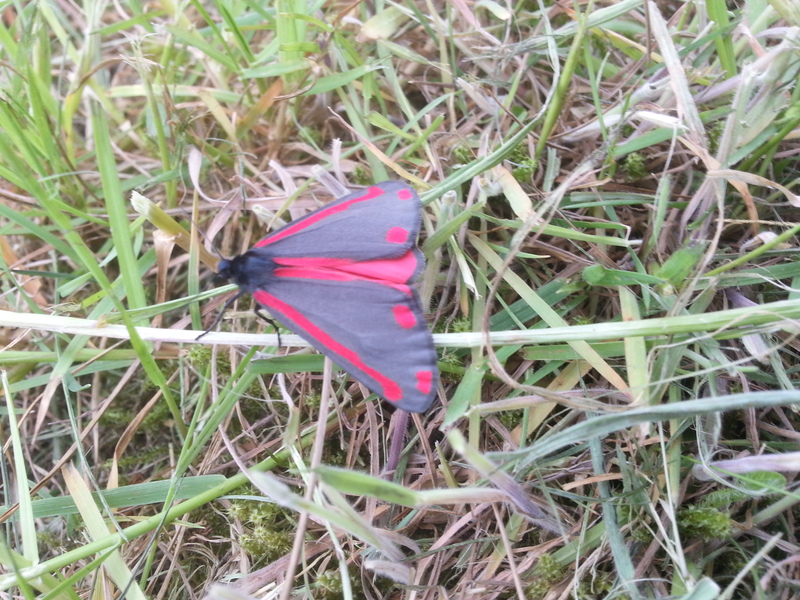 As mentioned earlier, there’s rather too much going on right now to read books and review them, so here’s a picture I took in my garden yesterday of a Cinnabar Moth (I initially mis-identified it as some sort of butterfly). One thing that is worth mentioning is that there are two sets of wings, and the lower set is completely red. You can just see them in the middle of the picture. When the moth flies it looks way more red than black, in fact I was surprised when it landed that the wings weren’t completely red. This is the first time that I’ve seen one of these, although I’ve seen the caterpillars a number of times, usually en masse devouring some ragweed, which I also have growing in my garden (or at least in the bits of it that I don’t manage to cut down). These are the caterpillars of the cinnabar moth. They have alternate hoops of black and orange all along their body, and can be seen from a distance.